Toilet training can be a difficult and challenging experience for children and parents alike, and the challenges can be magnified for families of children with Fragile X syndrome (FXS). It is not simply that toilet training is delayed for these individuals, but it often requires specific behavioral techniques that address the physical and behavioral phenotype of children with FXS. A thorough review of the literature, and subsequent discussions with parents, reveals no perfect approach. It is important to use the available information and adapt it to the individual child. Guidelines for toilet training with typically developing children are appropriate to use as an initial resource. This information can be found in many books and online resources. However, children with FXS face challenges that differ from their typically developing peers, hence general guidelines need to be modified. This article will provide concrete guidelines to determine when and how to initiate the toilet training process. We will discuss why these children may experience difficulties and suggest behavioral strategies to use when things do not go smoothly. Using age ranges and isolated strategies can create a dead end for parents who begin toilet training a child with FXS. In and of itself, an age range illustrates the variation in when children acquire certain skills. If a child falls outside that range, however, parents often feel anxious and guilty. Similar feelings arise when a list of suggestions is provided and nothing seems to work. A preferred method is to outline behavioral markers that indicate a child’s readiness, as well as a theoretical framework for difficulties children with FXS might experience with toilet training. This method removes the artificial timeline that can create frustration for parents and children, and opens the door to creative and individualized approaches that increase the likelihood of success. Being dry for periods of at least two hours, an indication of sensory awareness of having a full bladder or bowels. Recognition that a diaper is wet or soiled. Ability to communicate about wetness or toileting need. The motor skills to get to the bathroom, pull pants down and sit on the toilet. The ability and willingness to follow simple one-step directions. The ability to sit in one spot for several minutes at a time. This list illustrates that successful bathroom behavior is a complex task that involves all developmental areas. There are physical, cognitive, language, sensory, psychological and motoric requirements, all of which present difficulties for children with FXS. Given those requirements, it may seem a daunting task, but most children with FXS become successful with toilet training. The key is to provide support to address the child’s specific areas of weakness. We know we cannot change the skills required for toileting, nor can we eliminate the challenges that face children with FXS. What we can do is recognize areas of concern and provide the child with additional resources to increase the likelihood of success. We should address toilet training in the same way we approach other learning and behavioral tasks of children with FXS. That means a holistic approach that addresses all developmental domains. A holistic approach requires considering how FXS impacts each developmental domain, and then using adaptations and modifications that meet the individual child’s needs. We will review each developmental domain and consider the difficulties posed by FXS, along with suggestions to address these challenges. Children with FXS can experience loose stools, constipation or both. This may be caused by organic factors, limited diet and/or medication side effects. Loose stools can be difficult to control, and constipation can cause pain and discomfort. Both these conditions can inhibit toilet training. It is crucial to begin the process by addressing any physical issues. Prior to initiating toilet training, check with your pediatrician to make sure there are no physical issues that should be addressed medically. Discuss the consistency of the child’s stools to determine if additional fiber supplements should be added to her diet. Discuss the side effects medications may have on her bowels. Track the child’s toileting schedule. It is generally easiest to start with bowel training. Keep a schedule of your child’s elimination pattern to determine appropriate toileting times. Once you have a good idea of your child’s schedule, begin placing her on the toilet around the time she usually has a bowel movement. (Initially you will be the one being trained!) Once you have become successful with bowel movements, you can use the same process with urination. Children with FXS have complicated sensory systems: Some are hypersensitive and exhibit sensory defensiveness while others are hyposensitive (low or diminished sensitivity). This can affect toilet training. Some children cannot tolerate the feel of a wet or messy diaper, while others have limited awareness. Disposable diapers are so effective they may hinder the toilet training process because they do not allow the child to feel the wetness of the diaper. Use cloth training pants so your child can tell when he is wet. If you are not ready to try underpants, consider placing a non-absorbent cloth in your child’s diaper so he can be aware of feeling wet. Some children do not feel comfortable pooping outside of the diaper. If that’s the case, place a diaper loosely around the child and allow him to poop while sitting on the toilet. Gradually place the diaper further away from his bottom and closer to the bottom of the toilet. This type of behavior shaping allows the child to gradually feel more safe while adapting to use of the toilet. Many children have issues with gravitational insecurity. As a result they do not feel comfortable when they are up off the ground. Place the potty on the ground, or use steps that are solid to add a feeling of security. We know that children with FXS have delays in language development. It is important to note that delays occur not only with expressive language, but receptive language as well, which includes vocabulary. Typically developing children learn the vocabulary associated with toileting through everyday exposure. Children with FXS need to be taught these concepts using a multimodal approach. Use simple, concrete and consistent language when referring to body parts as well as the toileting act itself. If your child is non-verbal, apply whatever type of communication system is used in the other parts of her life. Excessive language is usually lost on these children. Short, two-to-three word sentences and directions are recommended. Since language development is often an issue, pair these words with signs. Research has shown the introduction of sign language often stimulates oral language. You may need to teach your child the concepts of “wet” and “dry.” When you check her diaper, let her know what you find. For example, if her diaper is dry, say, “Dry pants.” You may also want to place her hand inside the diaper to feel exactly what dry is like. The same holds true for being wet. Learning a new skill can be a slow process for children with FXS, but they do learn and make consistent progress. The key is to present the information in a way that is meaningful to the child. Individuals with FXS have strong imitation skills, and they learn by observing and copying. So it is important to provide your child with as many opportunities as possible to learn through watching and imitating. This is an additional opportunity for creativity and individualization. Within this area it is crucial to use high interest items and modalities. Read books to the child about toilet training, and watch potty training videos with him. Choose books that have limited language. Sitting and listening to an entire story is difficult. Allow the child to see family members or other children using the toilet, and use observational remarks such as “He is going potty” to narrate what is happening. Remember to use short sentences. Practice toilet training with a doll, action figure or stuffed animal, e.g. “Sponge Bob goes potty.” This allows the child to have control over the situation and to practice the sequencing of the tasks without pressure. Children with FXS can exhibit delays in both fine and gross motor skills. To ensure success, try to reduce demands on these skills. Dress the child in clothes that she can manipulate easily. Elastic waistbands work the best. Due to low muscle tone, balance can be difficult. Make sure that the child’s feet can touch the floor when sitting on the potty. This will increase his stability and make him feel safe. When using the big potty, place a block or an old phone book under his feet. This is probably the most difficult aspect of the entire process. Children with FXS can experience anxiety, but due to their limited language skills, we typically see only the ensuing avoidant behavior. This often leaves parents feeling frustrated and confused. It is best to try to decrease the anxiety, rather than try to guess what is causing it. Anxiety can be decreased by presenting the child with information about the situation in a way that is easily understood and will familiarize him with the new situation and the items that go with it. Provide a picture schedule. There is a good example of a toileting schedule with downloadable pictures on www.teacch.com/toilet.html. You can also create your own schedule using a digital camera. Spend time talking about the toilet, looking at it, touching it and sitting on it before it is time to actually use it. Do not initiate toilet training during known times of stress, i.e. right after a move, the arrival of a new baby, or other major changes. Toilet training often comes at a time when the child is exerting his independence, which can result in some defiant behaviors. The best way to avoid oppositional behaviors is to present choices and to allow the child to have control over appropriate aspects of the task. Involve the child in the selection and purchase of the training pants. There are a wide variety of choices and you should be able to find some that attract your child’s interest. Make it a special trip so that buying the pants is not associated with the generally unpleasant task of extended shopping. Involve the child in the selection of the potty chair as well. Allow the child to decorate the potty with stickers, etc. Many children with FXS have attention deficit hyperactivity disorder (ADHD). As a result they can have a difficult time sitting for even a few minutes. 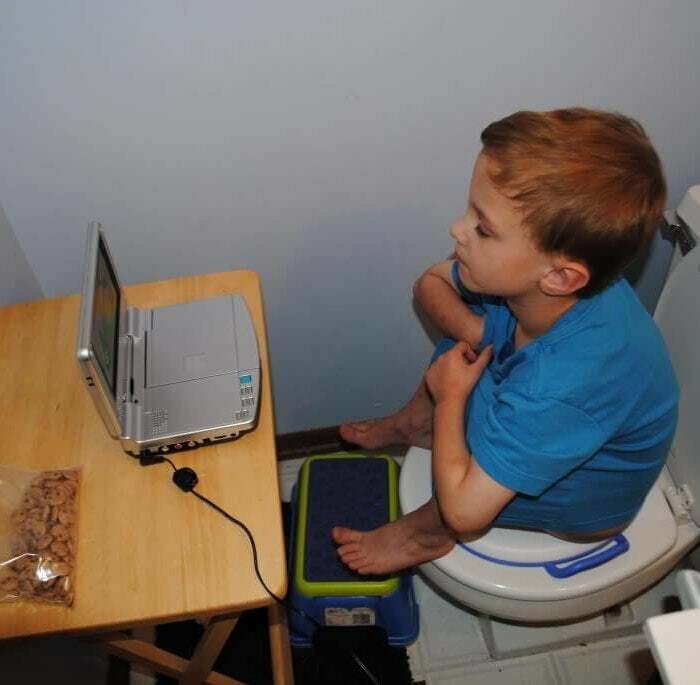 Modify the amount of time that the child sits on the potty when first learning. Guides for typically developing children often recommend 10 minutes, which is probably too long. Novelty will increase attention. Place some books next to the toilet. Get books from the library or purchase books that are only for the bathroom. This will keep them “new’ and engaging. Use whatever is engaging for your child that she can hold or manipulate while sitting on the potty. The foregoing is not meant to be a cookbook solution to potty training. The review of the phenotypic characteristics of FXS is meant to encourage parents to view toilet training as a complicated process that should be approached in a holistic manner. The strategies should be used as examples to guide the development of individualized approaches and adaptations. Another suggestion: Be patient, and balance persistence with a willingness to pull back for a time if things are not going well. Toilet training is a complicated process, and the child with FXS faces tough challenges. All children have accidents, so treat them gently. Be sure to move at your child’s pace and use encouragement and praise when he is successful. Children with FXS respond well to social praise, so external reinforcers (food, stickers) are typically unnecessary. If you do use such reinforcers, remember to keep them simple. Creating charts and using token systems are typically too complicated for children at this stage in their development. Finally, keep in mind that it is normal for any child, including those with Fragile X syndrome, to regress or appear at times to lose toileting skills. This is a process that cannot be rushed. Pushing a child who is not developmentally ready for toilet training may slow or disrupt the process. If you are becoming too frustrated, stop and try again in a month or so. There is nothing wrong with a parent taking a time-out to regroup, and it may well benefit your child so that both of you are better for having taken the break. Baranek, G.T., Chin, Y.H., Hess, L.M.G., Yankee, J.G., Hatton, D.D., and Hooper, S.R., (2002). “Sensory processing correlates of occupational performance in children with Fragile X syndrome: Preliminary findings.” American Journal of Occupational Therapy, 56, 538-546. Braden, M. (2000). “Fragile Handle with Care” (pp. 22-23) San Francisco: National Fragile X Foundation. Diagnosis, treatment, and research. (pp. 527-529), Baltimore: Johns Hopkins University Press. Hodapp, R.M., Dykens, E.M., Ort, S.I., Zelinsky, D.G., and Leckman, J.F. (1991). “Changing patterns of intellectual strengths and weaknesses in males with Fragile X syndrome.” Journal of Autism and Developmental Disorders, 21, 503-516. Karen Riley, PhD is the Dean for the Morgridge College of Educational at the University of Denver. She currently has a dual faculty appointment in Child, Family and School Psychology and Curriculum Studies and Teaching. 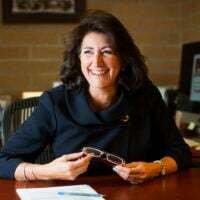 She currently serves on the Clinical and Scientific Advisory Board for the National Fragile X Foundation and has over 15 years of experience in working with and conducting research on FXS.